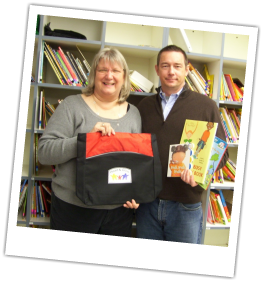 Synopsis: In October 2010, Pediatrician Paul Fowler teamed with Denise Thompson, School Readiness Coordinator in the Folsom Cordova Unified School District (FCUSD), and Sacramento County Youth Services Librarians Chris Davis & Donna Zick to create a series of "healthy book bags". Modeled on the national "Raising A Reader" Program, each book bag contains three books addressing health issues relevant to the 0-5 year-old crowd. Book topics include: healthy eating, teeth brushing, potty training, physical activity, hand washing, sleep and head lice. The goals of the program are to 1) encourage families to spend time reading/storytelling together, 2) increase the amount of time children spend with books before beginning Kindergarten and 3) relay messages about good health habits to parents and children. Throughout February and March 2011, the book bags were pilot tested with twelve families at select School Readiness Play Groups and one FCUSD preschool class. These twelve families were able to check out each of the three bags, one bag at a time, to take home and enjoy together for one week. Student nurses from Sacramento State's Division of Nursing, Charlie Dharmasukrit & Jana Boreham, organized and led two focus groups where parents provided feedback on the program and suggestions for the future. The families were generally pleased with the healthy book bag program and were unanimous in their desire to see it continue. Denise Thomson & CHPT VISTA Maura Reilly recently received a Target Early Childhood Literacy Grant. With these additional funds the School Readiness Program will make 144 healthy book bags available in all School Readiness Play Groups and FCUSD Preschools during the 2011-2012 school year and beyond! See the project handout, here.